With less than ten weeks left before the Conference, the pace is accelerating. As we enter the final planning stages, we are receiving an increasing number of messages of support from Japan and from abroad. Thank you very much! "GLOBAL ARTICLE 9 CONFERENCE TO ABOLISH WAR"
The US-led war and occupation in Iraq are at the core of the worldwide peace movement and grass-roots pacifist mobilization. In light of the tragedy taking place there, military and government officials have spoken out against the policies of their governments and engaged in opposing the war and occupation. Notably, Ann Wright served 29 years in the US Army and as a State Department official before publicly resigning in 2003 in direct opposition to the Iraq War. Since then, she has been deeply involved in the peace movement in the United States, working with Cindy Sheehan at the Camp Casey demonstration, picketing at Guantánamo, and serving as a witness at the trial of Lt. Ehran Watada. In a segment of the plenary session, Iraq Aid Volunteer and former Japanese hostage in Iraq Takato Nahoko will organize a discussion among US and Iraqi youth on how the war has affected them. Aidan Delgado (26 years old) joined the US Army on September 11, 2001 and began a year-long tour in Iraq in April 2003. As a Buddhist, he soon began to openly question whether he could participate in the war in good conscience. Witnessing abuses at Abu Ghraib prison, he applied for and received conscientious objector status on pacifist principles. He has been actively involved in the anti-war movement ever since. Kasim Turki (30 years old) served as a soldier in the Iraqi Republican Guard between 2001 and 2003. After the war, he was taken twice in US custody for speaking out against US attacks on Falluja and Ramadi. He is now an aid worker in Ramadi, involved in repairing of schools, establishing medical clinics, and providing emergency relief to refugees. Like them, famous Japanese writer and journalist Amamiya Karin (33 years old), once a right-wing activist and punk singer, distanced herself from her past to become actively involved in social justice and anti-war issues. By sharing experiences and bringing their own perspectives, the participants in this session will will engage with Japanese youth and provide them with models of young individuals who chose to change the course of their lives and get involved in the peace movement. 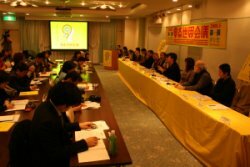 On February 22, a press conference was held to announce the program and further details of the Conference, as well as information about lead-up events throughout Japan. A dozen high profile Japan-based co-initiators of the Global Article 9 Conference were present, including Executive Director of Greenpeace Japan Hoshikawa Jun, Academy Award Nominee Film Director John Junkerman, Okinawa International University Political Scientist Douglas Lummis, President of Japanese Lawyers International Solidarity Association (JALISA) Niikura Osamu and Iraq Aid Volunteer Takato Nahoko. Around 50 media representatives attended the event, including journalists from international networks. As well as comprehensive coverage in the Japanese language, several articles have been published in English, including in the Japan Times and Kyodo News. In addition, Agence France Presse ran an article that appeared in many newspapers throughout Asia and beyond. The Article 9 Peace Walk is a pre-event of the Global Article 9 Conference to Abolish War. Planned and organized at the grass-roots level, the 71-day Peace Walk will carry the message of Article 9 throughout Japan, mobilize support and raise funds in support of the Conference. 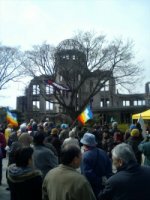 400 Peace Walk marchers departed from Hiroshima's Peace Memorial Park on February 24. Participants include lawyers, students, monks and former US soldiers. The marchers will stop and organize events in Kobe, Osaka, Kyoto, Nagoya, Fuji, Yokohama and many other towns along the way. They will reach Tokyo on May 3 to join the memorial gathering on the day of the 61st anniversary of the entry into force of the Constitution, and then arrive on May 4 at Makuhari Messe Convention Center for the opening of the Global Article 9 Conference to Abolish War. Over the last few weeks, several developments have kept Article 9 related debates at the forefront of public attention. After a four-month interruption, the Maritime Self-Defense Force resumed its refueling mission in the Indian Ocean. The mission remains however very controversial, as the Japanese Diet continues to be divided over the issue and lingering suspicions that MSDF fuel had been diverted for use in Iraq have not been cleared. The resumption of the refuelling mission comes amid distrust and criticism of the Defense Ministry and the Self-Defense Force, following the collision of a Maritime SDF destroyer with a fishing boat. The destroyer Atago, equipped with an Aegis defence system, was on its way back from Hawaii following missile launching exercises. Initial investigations show negligence occurred at several levels and raise questions over the accountability of the Japanese SDF. In addition, a series of incidents involving US servicemen, including two alleged rapes (one of the victims a 14-year-old girl), have exacerbated the long-held resentment against the US military presence in Okinawa. Women's groups have repeatedly condemned the recurring violence exerted by US servicemen against women. Additional problems include environmental pollution, noise, and the deterioration of public security near US bases. These incidents occur as Washington and Tokyo are seeking to relocate a major Marine air base in the face of strong local opposition. If you are planning to attend the Global Article 9 Conference, we recommend that you start looking into transportation and accommodation, as the Conference is taking place during Japan's Golden Week holiday season, one of the busiest travelling times in Japan. Golden Week celebrates four national holidays: the birthday of former Emperor Showa Day - former Emperor Hirohito's birthday (April 29); the anniversary of the the Constitution, which entered into force in 1947 (May 3); Greenery Day (May 4); and Children's Day (May 5). Please check the web site in mid-March for registration procedures and a list of acommodation in the vicinity of the Makuhari Messe Convention Center. We count on your participation in the Conference and look forward to your contribution! Thank you for your interest in and support for the Global Article 9 Campaign to Abolish War. We hope that many of you will be able to join the conference from May 4-6 in Tokyo. In the meantime, feel free to contact us to share your ideas, support, experiences and expertise!